Saw what appeared to be a very nice 1965 Mercury Ranchero at my local Sam’s Club (Tucson). I know some Mercury trucks were built and sold in Canada from 1948-1968, but never heard of a Ranchero model. 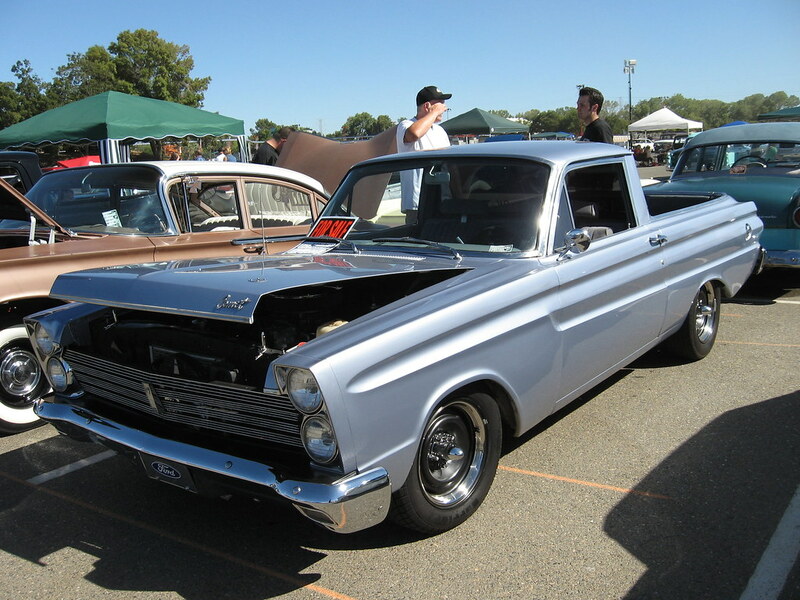 This looked as though someone might have attached a 1965 Comet front clip to a Falcon Ranchero. If so, it was amazingly well done. Or could this have been a genuine Mercury Ranchero? There’s a picture of a Comet / Ranchero custom on Flickr, too. Google “Mercury Ranchero” and see. Maybe that’s what you saw. I think it’s a one-off, there was a Meteor Ranchero (Canadian) but that stopped in '58. Sounds like someone did some custom work to me. Did it have a Mercury tailgate? The only make/model markings were on the front fenders which had separate “Mercury” and “Ranchero” scripts. The entire rear portion–including tail lamps–looked like stock Falcon Ranchero but with Futura style trim. The only marking on the tailgate was a chrome cow skull. The steering wheel had “S-22” script on the hub. As I said in my original post (and as most seem to agree) this looked most likely that it was an exceptionally well done custom job; good enough that I wondered whether it just might have been legit. The tail lamps were the major failing, though, as Mercury wagons that used Ford quarter panels usually had Mercury style tail lamps fitted to the round Ford openings. I believe someone got creative. Don’t know about that one but I did see a 57 Ranchero with a 57 Edsel front end. It was a simple bolt on, no customizing. I saw one just like it at the Sacramento Autorama this year. It even had chrome script that read “Comero” where it would have read “Comet.” It may not have been factory, but it was really well done.